If you're anything like me, you like to leaves things slightly last minute. Not so last minute that you're stressing, but not ages in advance, which is why my Christmas Gift Guide is later than most. I haven't even thought about presents, and have given no thought to my Secret Santa at work either. You can see a few of my gift guides dotted around over the last few weeks, but this is a more in depth general one that I hope will help! 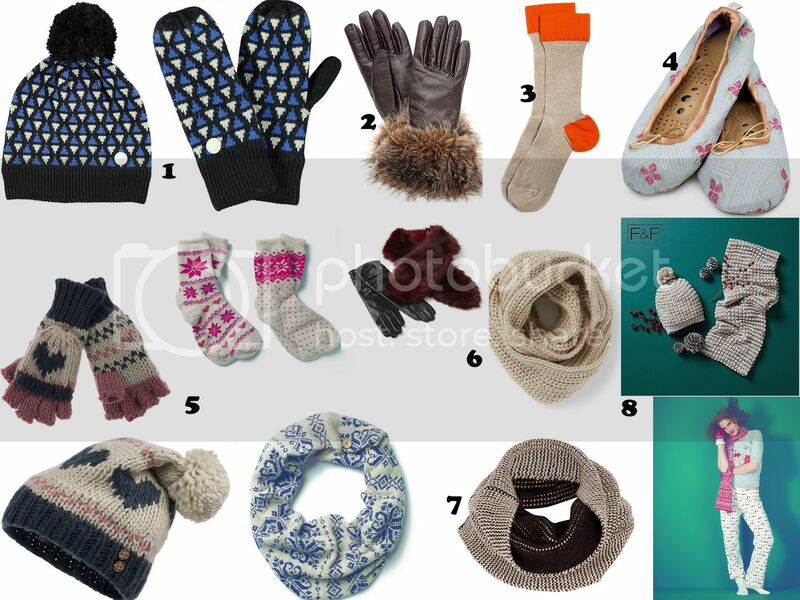 Christmas is all about the cold, which is why I have a huge selection of gloves, hats and scarves. I love wrapping up in these knits so naturally I've picked out a lot as gifts. They're a perfect gift to give and are so cute. 1. 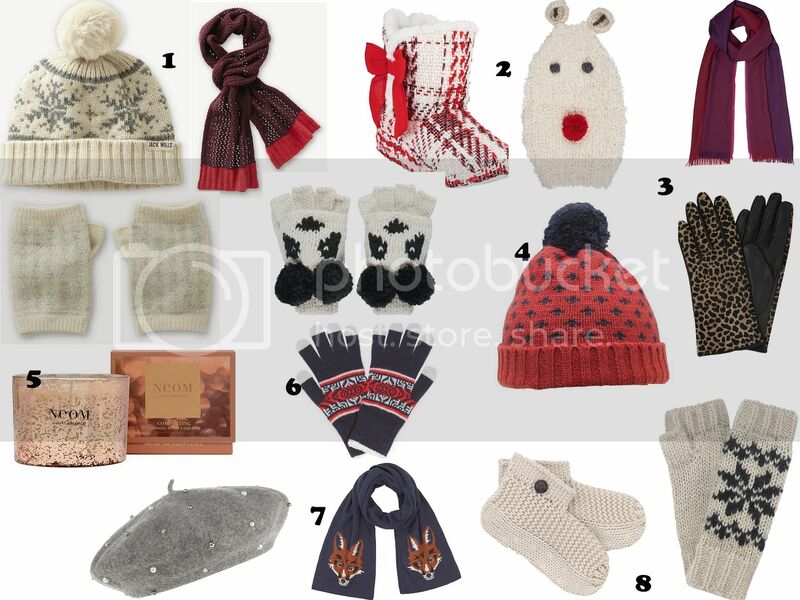 Jack Wills: Jack Wills definitely have the cutest little winter warmers. They have such cute styles and prints, and so many great matching ones. 2. Next: So much love for these ones. The fun gloves and hat with the animals are so adorable! And how amazing would it be to open up a present with those booties. 3. TM Lewin: I'm massively impressed by TM Lewin these days. These pieces would be a great way to stay warm at work and so chic and sophisticated. 4. Gant: I've always loved Gant. The quality is second to none and this beanie hat is such an amazing style. I definitely need more Gant in my life. 5. Neom Candle via MyShowcase: My Showcase has a wide variety of really nice beauty products, and I definitely had to include a candle as a winter warmer. My Showcase will definitely have something for everyone. 6. Etre: I already have a Etre pair of gloves and they're amazing. They're so warm and I love that you can use your phone with them too. The wool used is such high quality and so cosy. 7/8. Marks & Spencer: Again, really impressed with their collection these days, and the winter warmers are no exception. I love how cute these pieces are, especially the fox scarf and the embellished hat. Check out more of their gifts here. 1. Bench: I love the geometric design of this Bench set. Bench are always such great value and have some really cool pieces that are definitely worth checking out. 2. Phase Eight: Isn't this pair of gloves the most amazing thing ever? I love the brown leather on it, while the fur gives it such a fun and unique look. 3. Princesse Tam Tam: Because you can never have too many socks in your life and Princesse Tam Tam have one of the best ranges of cosy nightwear and lingerie ever. 4. Holistic Silk Slippers: Christmas is all about relaxing so why not give someone a pair of silk slipper. They're look incredible and I can imagine them being really soft. Holistic Silk do some really cosy looking pieces. 5. Fat Face: I kind of live in Fat Face knits in the winter. I love their selection of hats and scarves, and these will be such a cute gift to give anyone, especially a nicely patterned set. 6. Tie Rack: They always have an amazing array of bits for Christmas and I love this super knitted scarf so much. It'd be great to wrap up warm in, while the glove and fur scarf are so elegant. 7. Comptoir des Cotonniers: You can't go wrong with a bit of Comptoir des Cotonniers in your life and this snood looks so incredibly warm. 8. F&F: More and more of my closet is F&F these days. I love this hat/scarf set, while the pajamas are so cute. You can always relay on F&F for really stylish pieces, that are super incredible. I love stocking fillers. While these aren't necessarily things that could fit into a small stocking, they're still fun little presents to give someone while not breaking the bank. 1. BackBeat Go 2 via Plantronics: We all know my obsession with headphones, so naturally I love these. Plantronics seem like an amazing headphone company, so perfect for any music lovers in your life (meeeeeee). They look so cool and lightweight and I love how they're wireless, with their own charging case. You can also connect it to your phone and use it for calls with the Bluetooth. 2. Buckley London: Buckley do such amazing jewellery and it's such great price. I love all the sparkly bits, while the sets are so perfect for any girl who likes a bit of bling in her life. 3. The Hobbit on DVD: One of my favourite films of the year, and the Blu Ray extended version is exactly what I want. I can't wait to watch it again. 4. Anna Lou of London: While Anna Lou does amazing jewellery, I was so happy that they have some great candles too. This set looks amazing and they're all natural. I reckon these would be so lovely to burn. 5. Swatch Factory: Swatch Factory are a brand to keep an eye one. I love their selection of cushions so much. They are the sweetest things ever. They have a cute children's bundle with illustrations from Roald Dahl books and a bundle is only £15!! These are books I grew up with so I would love to cuddle up with one of these cushions! I also recommend their eye brow cushions too. 6. Lush: Lush do the greatest little Christmas sets, from bath stuff to creams. I do love Lush so can't wait to head on over and sort out all my Christmas gifts. This set looks like it has some really nice pieces in it too! 7. Princesse Tam Tam: Another really cute piece from Princesse Tam Tam. I love the cute colour and packaging too! 9. M&S: A Doctor Who Tardis keyring. Do I need to say anything else? 10: Biba via House of Fraser: House of Fraser has some really nice pieces for Christmas this year, and the Biba line is stunning. I love this collar so much - great to add to a dress or plain top. 11. A book: A book is definitely the greatest gift to give. Nothing compares to curling up next to the fireplace with a good book. I recently read Mindy Kaling and loved it! One that all girls need on their bookshelves. Stay tuned for part two of my Christmas Gift Guide coming through, which will feature some more expensive bits and pieces - great for the girls that you love. Ooh, I want it all! That Mindy Kaling book has been calling my name for far too long!! nice stuff! Have a great week! Thanks for featuring our cushions, Sherin! I've promptly gone and added the boots at #2 to my list, so cute!